Prison is not a place you should end up in at any point in your life. It’s an incredible rule to try and follow. Yet if you should ever go to prison then try not to do it in a foreign land. The results are never pretty. Unfortunately, Billy Moore didn’t listen to this life lesson and ended up at a Thai prison. Afterward, Moore wrote a memoir of his brutal time in prison which eventually became an international bestseller. Now, that memoir is now a feature film. Unfortunately, A Prayer Before Dawn is a film that’s not for everyone. It’s definitely a film for patient viewers. A Prayer Before Dawn follows Billy Moore, a drug user that is sent to prison in Thailand. As things begin to look dire, Moore begins to find new life through kickboxing. Now, he must fight in Muay Thai tournaments in order to earn his freedom. Easily the biggest problem with A Prayer Before Dawn is its incredibly slow pacing. The film moves at a snail’s pace before it gets to the kickboxing portion of the film. Not to mention, there is very little dialogue and zero music to grab your attention. It’s a raw experience, to say the least. But the stuff that you see is really startling to watch. It establishes early on the this is not a prison that you want to be in. In addition, it’s crazy to see how the Thai prison system is like over there. Needless to say, it makes our prison system look like Club Med. But the culture over there seems very similar to our own. At least, by Hollywood’s interpretation of our prison system. There are gangs with a ton of tattoos, an overcrowding of inmates, beatings, and other stereotypical prison tropes. Besides the film being shot in an actual Thai prison is what the film is trying to sell. Not to mention, the cast is all ex-cons who spent time in a Thai prison. So it certainly delivers on the realism. Yet showcasing the prison is essentially the only type of development that goes on in this film. Not only does poor Billy get imprisoned but he also doesn’t get any character development at all. As a result, you may not root for the guy to overcome his predicament because you just don’t care for him. After all, why we would we care for a guy who’s a heroin addict and doesn’t have any redeeming qualities? Therefore, don’t think that this is a Rocky type of film. Nevertheless, the kickboxing scenes are brutal as they are realistic. There’s no smooth choreography or fancy cinematography. There’s only grit and authenticity here. In addition, you won’t find any elaborate training montages here. As previously mentioned, this isn’t Rocky or even Van Damme’s Kickboxer. Joe Cole does what he can with the limited lines that he’s got. He certainly nails the physicality of the role. Cole has the look and feel of a boxer and fights like one too. But just like his limited lines, he shows a limited amount of emotion as well. This isn’t necessarily his fault. Instead, it’s a byproduct of the type of role that this is. 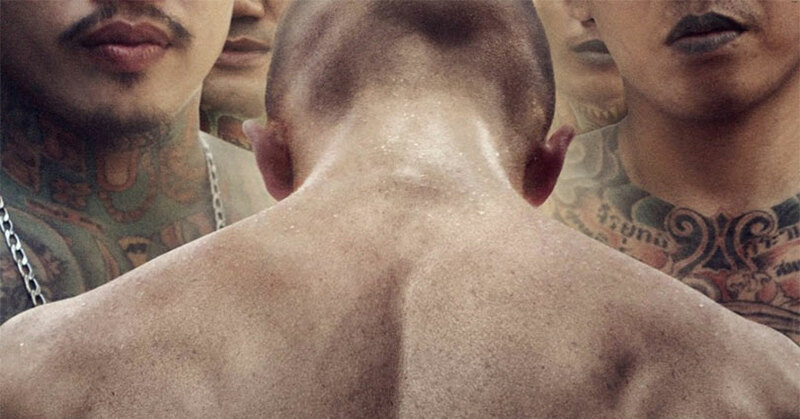 Overall, A Prayer Before Dawn is a raw, dark, and hellish look at prison life in Thailand. It certainly provides an interesting look at prisons unlike our own. However, the extremely slow pace and unsettling scenes may put off some viewers. In other words, Prayer isn’t for the casual film watcher but for a niche group instead.